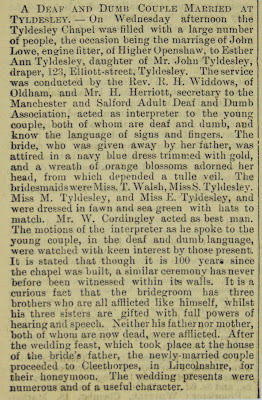 A Deaf and Dumb Couple Married at Tyldesley. — On Wednesday afternoon the Tyldesley Chapel was filled with a large number of people, the occasion being the marriage of John Lowe, engine fitter, of Higher Openshaw, to Esther Ann Tyldesley, daughter of Mr. John Tyldesley, draper, 123, Elliott-street, Tyldesley. The service was conducted by the Rev. 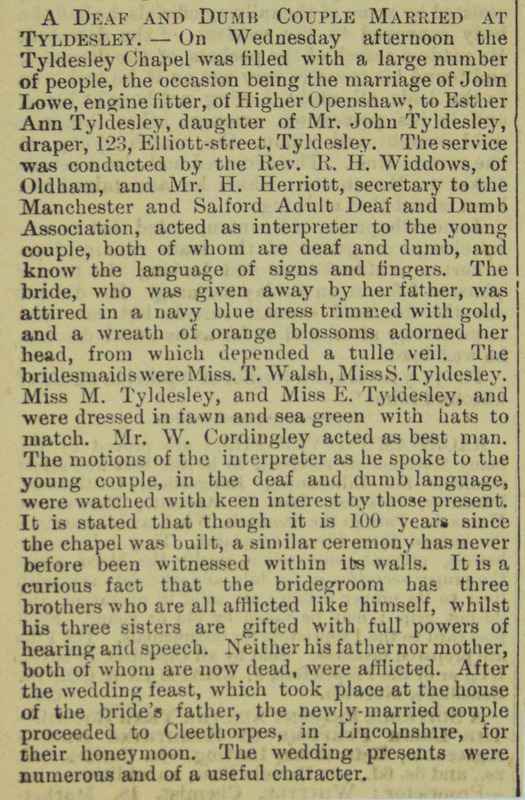 R. H. Widdows, of Oldham, and Mr. H. Herriott, secretary to the Manchester and Salford Adult Deaf and Dumb Association, acted as interpreter to the young couple, both of whom are deaf and dumb, and know the language of signs and fingers. The bride, who was given away by her father, was attired in a navy blue dress trimmed with gold, and a wreath of orange blossoms adorned her head, from which depended a tulle veil. The bridesmaids were Miss. T. Walsh, Miss S. Tyldesley. Miss M. Tyldesley, and Miss E. Tyldesley, and were dressed in fawn and sea green with hats to match. Mr. W. Cordingley acted as best man. The motions of the interpreter as he spoke to the young couple, in the deaf and dumb language, were watched with keen interest by those present. It is stated that though it is 100 years since the chapel was built, a similar ceremony has never before been witnessed within its walls. It is a curious fact that the bridegroom has three brothers who are all afflicted like himself, whilst his three sisters are gifted with full powers of hearing and speech. Neither his father nor mother, both of whom are now dead, were afflicted. After the wedding feast, which took place at the house of the bride's father, the newly-married couple proceeded to Cleethorpes, in Lincolnshire, for their honeymoon. The wedding presents were numerous and of a useful character.